Article by Klaus K in Denmark translated into English (with my slight assistance). Many smoking bans in the western world were introduced at the start of the millennium on the recommendation of the UN Organization WHO (World Health Organization), who claims that indoor tobacco smoke can cause lung cancer and heart disease in non-smokers. Since then many skeptical scientists have said that the scientific evidence for this claim is weak [ 1 , 2 , 3 , 4 , 5 ] – and now a comprehensive statistical analysis of all published studies on the relationship between passive smoking and lung cancer has found that there is no link between passive smoking and lung cancer. The full analysis is published online: Link here – pdf here. The analysis was done by the statisticians in the British consulting firm PN Lee Statistics and Computing Ltd, which for 30 years has performed expert analyses of poisons, drugs and diseases for the UN-organization IARC (International Agency for Research on Cancer), and for private companies in the pharmaceutical industry, the tobacco industry and the chemical industry. One of their tasks is monitoring the published studies on passive smoking for the tobacco industry, and these studies are collected in a database with associated analyses that are available on the company website. The British statisticians have corrected the studies for several error sources, including ‘smoker misclassification’ (ie the fact that some smokers declare themselves as non-smokers in surveys, and thereby distort study results). They have also adjusted the material for the known ‘confounders’, ie other risk factors for lung cancer. These sources of error push up the overall risk of passive smoking to unrealistic highs, because they are not taken into consideration in many of the 102 studies, writes the statiticians. In their adjusted meta-analysis of the studies the overall risk result was down to 1.08 (0.99 to 1.16), which is not different from zero, because the correlation is statistically insignificant. 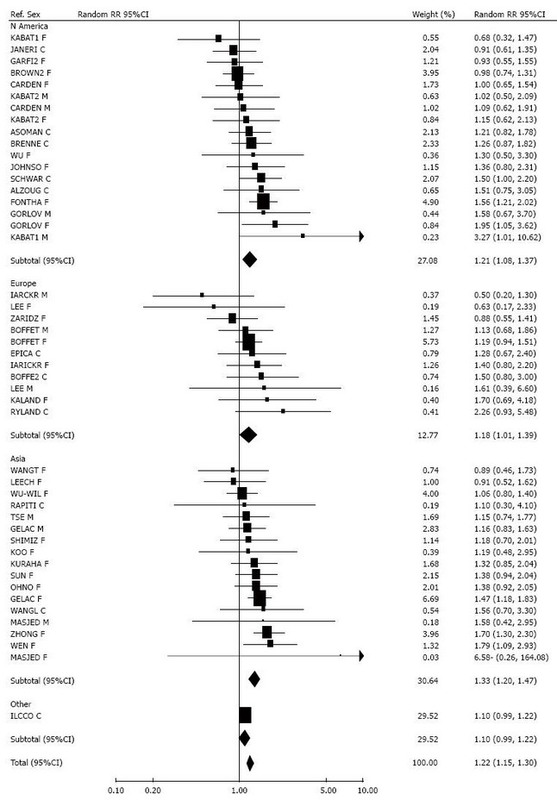 The result covers a negative (inverse) correlation between lung cancer and passive smoking in North America and Europe of 0.96 (0.86 to 1.07), while there is a small increased risk in Asia of 1.18 (1.07-1.30). To put in clear layman’s language: When no clear link between passive smoking and lung cancer exists, it cannot be claimed that passive smoking causes lung cancer. The 102 studies have been performed in North America, Europe and Asia during the period 1981-2015. They are all epidemiological studies – that is, statistical population studies that have examined lung cancer-rates among non-smokers who in questionnaires have stated that they have been exposed to secondhand smoke at home, work or elsewhere. Their lung cancer rates have been compared to the corresponding rates of those who reported that they were not exposed to passive smoking in these places. This is the standard method used to find potential disease associations for most risk factors. 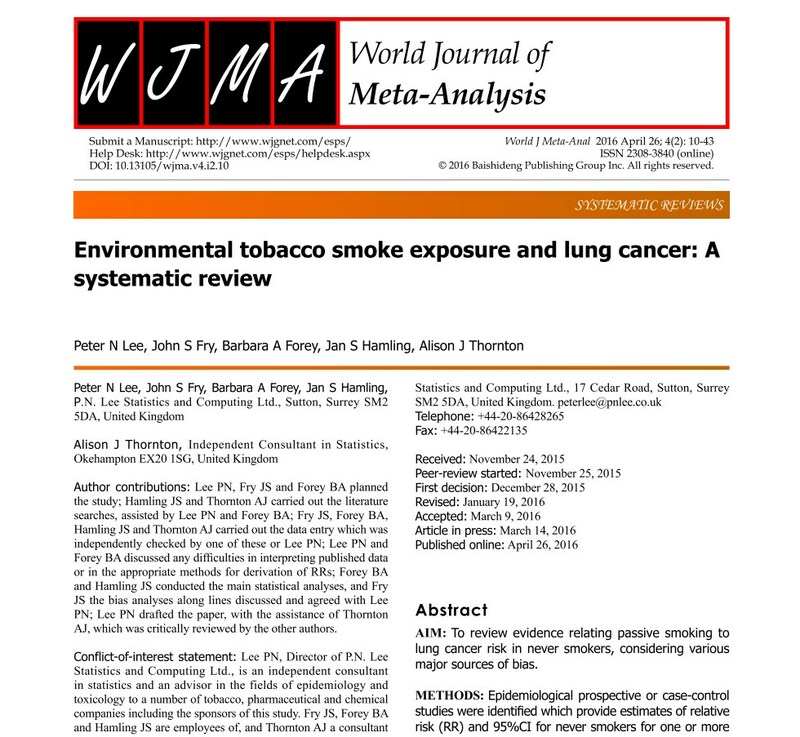 The new analysis is an update of the statiticians’ 15 year old series of articles on passive smoking, in which they also disputed the official findings on lung cancer and passive smoking. Since then, many new studies have been published, but they have only watered down the weak statistical link between passive smoking and lung cancer further, according to the analysis. The British point out many strange features in the 102 studies, when taken as they are – ie before correction: Only a few of the studies (app. 16%), report a statistically significant increased relative risk – this is most frequently in the smallest and simplest studies of low quality. The rest of the studies (nearly 85%) show no statistically significant increased risk. And more than 25% of the total number of studies show a negative (inverse) correlation between passive smoking and lung cancer – some of them statistically significant. Another remarkable circumstance: It is only in the studies from Asia that a significant association between passive smoking and lung cancer can be found. In the rest of the world the relationship does not exist. The British statisticians explain the difference between the Western and Asian studies by cultural differences: Asian women are more likely to deny that they are smokers in surveys than Western women. This trend among Asian women affects the risk in the Asian studies in an upward direction because smokers usually marry other smokers – so when smoking Asian women are pretending to be non-smokers, then their much larger (smoking) risk of lung cancer is attributed to the non-smoking passive-smokers in the studies. This is called ‘smoker misclassification’ – it is found everywhere, but it is far more common in Asian studies, according to the analysis. The picture does not seem clearer with the unadjusted association between lung cancer and passive smoking in workplaces. This relationship is of course interesting because it is the one that underlies the smoking bans. Again, risk estimates are much higher in Asian studies than in studies from the rest of the world. In the studies of passive smoking in the European workplace the relationship is non-existent: None of the 11 published studies from Europe show a statistically significant association between lung cancer and passive smoking in the workplace. And 27% of the studies from Europe show a negative correlation (3 out of 11). See graphic. Furthermore, the British examined the association between lung cancer and passive smoking in childhood and adolescence, in which there also can be seen a small increased risk in Asia. However the majority of studies on passive smoking in childhood from USA & Europe is negative, and the overall result of the Western studies is zero. In the United States: 1.06 and in Europe: 1.02, both before correction. Seegraphic. An interesting – and statistically significant – negative result occurs when all studies of the relationship between lung cancer and passive smoking from parents in childhood and adolescence is combined: 0.78 (from 0.64 to 0.94). This means that children who grow up in smoking homes are significantly 22% less likely to get lung cancer than children who grow up in smoke-free homes. See table. The link between passive smoking and lung cancer is in other words totally unclear. If there exists any lung cancer risk from passive smoking, the risk is so close to zero that it has no meaning and can be ignored. If extrapolation is done with this method the increased risk of passive smoking would end up at 1.008 – i.e. an increased risk of lung cancer less than one per thousand – compared to the 1.22 higher increased risk shown in the uncorrected statistical studies. Most, if not all, of the ETS/lung cancer association can be explained by confounding adjustment and misclassification correction. Any causal relationship is not convincingly demonstrated. built on a simple lie? The authors diplomatically refrain from writing about the smoking bans, which are based on the claim that passive smoking can cause lung cancer and heart disease. As it is clear from the published evidence, passive smoking has not been shown to cause more lung cancer than no passive smoking has done. The lung cancer relationship has been the authorities’ strongest case against passive smoking. The link between passive smoking and heart disease is even more uncertain, which can be ascertained in the British statisticians’ unpublished paper ( 7 ) and associated meta-analysis ( 8 ) of the relationship between passive smoking and heart disease from 2015. Here it appears that only one out of 22 studies (app 5%) has shown a significantly increased risk of heart disease from passive smoking in workplaces. The other 95% of the studies have shown no statistically significant increased risk. Half of the studies are negative ( Table 5 ), and the overall result before corrections are insignificant: 1.08 (0.99 to 1.19) ( page 2 ). It may seem strange that the authorities have succeeded in banning passive smoking in many private companies all over the West, for there is no evidence of disease risk from passive smoking in public space when all of the published literature is considered. Nevertheless, many authoritative health reports have been particularly vocal on this – that smoking bans had to be implemented and maintained because passive smoking caused fatal diseases. This entry was posted in Uncategorized and tagged cancer, smoking ban. Bookmark the permalink. As regular readers here know, smoking bans are based join ideology not empirical evidence. Perhaps, the lies and manipulations can be exposed once again. The foundations of tobacco control are fragile ad exposing the second hand smoke scam may help further erode the credibility of the tobacco control racket. In addition the Northern Territory government is repealing a local outdoor smoking ban in Darwi’s CBD. See “NT Government to overturn Darwin CBD smoking ban” http://www.ntnews.com.au/news/northern-territory/nt-government-to-overturn-darwin-cbd-smoking-ban/news-story/d18349d43e2d636a338610d425933a4c and “NT govt at odds with Darwin smoking ban” http://www.news.com.au/national/breaking-news/nt-govt-sidesteps-smoking-ban/news-story/84da584a16241f83ca3ec541436ba125 It seems even neb-prohibitionist Australia is on the cusp of moving away from draconian bans which have recently been spreading across Australasia (both OZ and New Zealand). As a Romanian national, I can confirm that this ban has nothing to to with science or health – it was pushed by a part of the social democratic party together with some very vocal NGOs whose leaders would’ve made Goebbels proud. The main argument was that the rest of Europe has adopted such bans, so in order to be a ‘civilized country’ Romania has to do the same. What’s even more tragic-comic is that soon after, Moldova, a country which is even more corrupt and in the shitter than Romania, adopted a similar ban. What disgusted me was that at least one medical journalist whom I respected parroted the line of ‘passive smoking kills yearly 3 times as many people as road accidents’. I thought even stupid people could see how BS and insulting this argument is. And how enthusiastically do they police the ban in Romania, JL? Do they (like in Greece) pay lip service to the idea and not actually enforce it, or do they actually police it? I think it’s policed quite well (at least I don’t see any ashtrays inside bars/cafes and they all seem to have big ‘no smoking signs’ on the door – which I always read in my head ‘do not enter’). On the other hand, the ban was introduced in mid March, and soon after the weather was warm enough that people could sit at tables outside (I read reports right after it was introduced that at least in Bucharest and other big cities, the cafes/bar in popular areas provided blankets/outdoor heaters for their patrons). Yes, we need to spread this far and wide!! 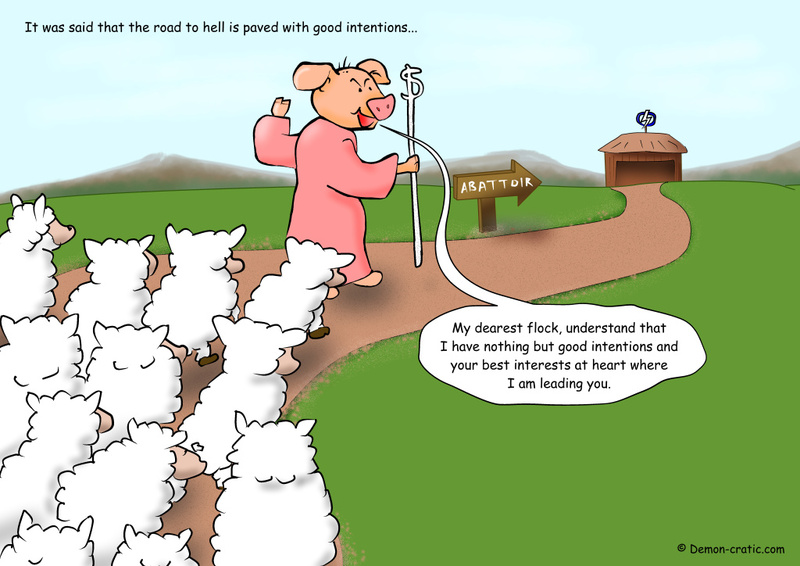 Or bleating attack. One of the authors–Peter Lee– has long been tagged by the aunts as a pro-tobacco lackey. ..
.The heart stiudies showing a “risk” (tho, try as they will, a low one like 1.23 ) have been rigged from -or before- the start, having been conducted by the likes of Glantz and Welles. In one often cited study by –I think the guy’s name was He, though I may have his study mixed up w another– I once called Siegel’s attention to the fact that in his meta-analysis he admitted to having excluded all studies showing no risk on the stated grounds that they didn’t agree with the studies he (or He) preferred–ie, the ones showing risk. Even Siegel was forced to admit to the rigging. You’re probably right, Walt, insofar as the whole thing will be written of by the TC lobby because the firm has done work for the tobacco industry; ergo they are paid shills of ‘Big T’ so anything they produce (which disagrees with the TC narrative) is obviously a cynical attempt by the tobacco industry to undermine all the good works done by those nice people in Public Health. The study will never see the light of day, because TC will make absolutely certain that it never gets anywhere near the MSM. Same as anything which doesn’t agree with their version of reality. I think it was one of the, if not the, key paper used by the SCOTH committee in the UK, to justify legislation to ban smoking in all workplaces including private bars, pubs, cafes, clubs etc. I might be wrong about that though. Indeed, a great job. Thanks Walt. When Hirayama first came out I thought it was a death blow to my weird ideas about ASH et al telling a bunch of lies in the 1970s. The internet was barely alive in the early 80s and it was very hard to get information even with days upon days spent in U of Penn’s medical library. After getting and reading the study itself though I realized the outstanding flaw was indeed the cultural aspect of how women, at least respectable married women, were viewed in Japan (and Asia in general?). My sense was that about 90% of Japanese prostitutes smoked and about 2% of the “respectable married women” smoked — or at least admitted smoking. However, a good 60%+ of the men smoked and I realized that a lot of their wives (who didn’t have to worry that a miniscule whiff from an afternoon cigarette might alert a nonsmoking husband) were probably “secret smokers,” even if only occasional light smokers. Given the relative dosages of smoking a cigarette oneself and being exposed to a half dozen being smoked by another in one’s home, it seemed reasonable to expect that any “secondhand smoke” cancer relationship would be rapidly dwarfed by secret smoking by even 1% of Japanese wives of smoking husbands, and more than dwarfed if 5% or 10% of such mixed-marriage-wives engaged in the sin. The great vast majority of any increase in such wives’ lung cancer would come from that smoking rather than from any secondhand smoke. I didn’t quite have the statistical expertise to make really proper corrections, but even the primitive calculating I did at the time, using just the single corrective factor of the above assumptions, was more than enough to show that Hirayama was a “paper tiger” and almost certainly a deliberate paper tiger: a propagandist pushing a conclusion rather than a scientist seeking information. 10.3.88 The Japanese wives study is FULL of confounding variables. Societal bias against J women admitting they smoke . a) J wives stay at home, don’t go to bars etc ergo unlikely to start smoking unless the husband smokes. b) A wi fe who DID start smoking would be likely to be found out and chastised by husband unless he also smoked and therfore didn ‘t realise it!! c) Unless the interviews were done in a VERY in-depth and confidential format, it is only logic al to assume that the wives would greatly underreport their smoking. Psycho-genetic factors. Smokers eating more fr ied foods therefore the wives cook more fried foods and breathe the fumes more. Smoking is probably economically related to certain strata within J that also relate to geographic location/ air pollution variables. E.G. concentration of smoking men in central Tokyo?? Statistical imbalance: the average wife of the average smoker would only “consume” the equivalent of about 1/100 of a c per day. Yet the study purports to show them as having a lc rate similar to that expected for female smokers of 10 cs per day. The statistical relation claimed is about 1,000 times that expected by theoretical analysis. Average J home has a VERY high rate of air exchange: therefore exposure would be even less than our figures would indicate! It seems that Lee et al have done what I had neither the skills nor the capacity nor the resources to be able to do thirty years ago: not only perform true statistical analyses with proper (as opposed to guessworked) corrective factors, but also expand such analyses far beyond a single study! In a fair world this new study would be making headlines around the planet. Unfortunately we don’t live in a fair world. The official female smoking rate in Thailand is 3%, but I spend quite a lot of time there, and I would put it higher than that from my observations, although it’s still a low figure. It’s culturally not really acceptable for women to smoke there, so they tend not to smoke in public or where they might be seen. But I know several women who would deny being a smoker, but who enjoy a ciggy when they’re relaxing away from the public eye. Excellent article. This should be front page news in the MSM. Thanks to Klaus K ! Thank you Klaus, curious about the Asian women though, is that Asian women in the west or Asian women in Asia? You don’t have to be a smoker to suffer from Chronic Obstructive Pulmonary Disease (COPD). Indoor air pollution is enough for one to contract the infection, says the first-of-its-kind study conducted at 22 villages of Pune. “Among those identified to have COPD, only 7% were smokers and 93% were never smokers, indicating that smoking is clearly not the most important risk factor for COPD in India. More importantly, 23% of the COPDs occurred in age group less than 40 years, which has not been reported earlier, says Salvi. It has always been believed that COPD starts occurring after 40 years and above in people who have smoked for over 15-20 years. But in India, indoor air pollution seems to be the most important cause so the disease occurs in earlier age groups as well because of exposures from childhood, he explained. “The study was conducted in 22 rural villages in Pune district with a population of over 1 lakh. As many as 3,000 adults over the age of 25 years were randomly selected for the study which used a standardised respiratory health questionnaire and spirometry (lung function test for determining COPD). In the western, tobacco smoking is believed to be the most important risk factor for COPD. However, recent evidence refutes this. “Exposure to biomass fuel smoke is the biggest risk factor, not only for India, but even globally. Compared to 1.1 billion smokers, more than 3 billion people (50% of the global population) use biomass fuel for cooking and heating purposes worldwide,” Salvi said. She was part of the 2010 intake of MP’s and is no stranger to Frank’s blog readers. I had no idea that she had joined the Leave campaign and to have done so strikes me as very much out of character. “Totnes Conservative MP and former GP Sarah Wollaston argued that the terms ‘standard’ and ‘plain’ packaging were misnomers. What it means is that we are handing someone a packet with a picture of gangrene. I can’t really see her wanting to be in a newly free and Independent Britain. A cynic might say this is part of the scaremongering plan, possibly a private agreement with the Remain inner circle. LBH, the woman can’t really think for herself, as indeed can’t most high profile politicians. If there’s one major personality difference between the two factions, it’s that the Leave campaigners generally have greater integrity. I think you might find that they’re also more likely to see through the Nanny State propaganda, yet have limited powers in government. E.g. David Davis and Philip Davis for starters. It’s a sad fact that many of those elected to lead us are not fit to do so. Great cartoon RooBeeDoo! :) Prog, yes, most fully agreed! You might very well think that, Roobee, but I couldn’t possibly comment. Well she was looking very pleased with herself on the BBC this morning. It’s one thing to stop campaigning, but another thing entirely to then start campaigning for a group that is diametrically opposed, on the very same day. Rose, agreed it may be unlikely, but it was just too appropriate to pass up. I can see “undecideds” moving around, but it’s hard to see why someone who came out early and strongly for Brexit would switch to Remain unless there was some external force involved. Has she revealed convincing reasoning (other than just repeating propaganda sound bites)? If not, hey, maybe she’s been secretly tippling while ranting against it! The Asian cancer paradox, I suggest, has a much simpler explanation than making the assumption that Asian women lie about smoking. and China has only two thirds the Male lung cancers of USA. Conversely, ONE THIRD OF ALL THE WORLD’S new female lung cancers occur in China – but only about 3% of Chinese females smoke! Simple logic tells us that 60% male smokers versus 3% female smokers, means there will be far more Non Smoking women living with Smoking husbands than not. Therefore statistically there has to be substantially more lung cancers in women who live with a smokers than those who do not, EVEN if smoking was NOT a cause of lung cancer. It would be easy to wrongly blame this on SHS! ‘It would be easy to wrongly blame this on SHS’. Implementing smoking bans is very cheap (total prohibition being very costly), makes governments seem genuinely concerned about the plebs and diverts attention away from actual causes of illness, not least environmental pollution that very few politicians are willing to address seriously. As ever, it ultimately boils down to economics, power and greed. Very good point. Just the sheer weight of numbers gives the impression of an association. The one thing that has differentiated this study from others is that it has been produced by REAL statisticians and not ignorant TC ‘experts’. That is what I have been hoping for – REAL statisticians to emerge. They have not yet done so regarding Climate Change. In the Brexit debate tonight on ITV, the ‘Remains’ went on and on about Climate Change. It is so passe. Those MPs are anchored in the past. There is no global warming. Frankly, I am sick to death of ALL political hysteria. That is what we have to correct. Pingback: First they came for..